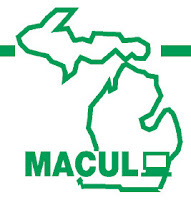 I participated in the 2012 MACUL Conference last week. This was a state-wide ed tech convention attended by 4,000 educators. Though Susan Smith, Ann Lusch, And I presented (Free Multimedia Activities for Secondary Students That Don’t Gobble Time!) during one session, most of our time was spent attending other presentations. * Presently, the Michigan Ed tech world is for better or worse, being swept by iPad mania. The sessions about iPad were jammed or even closed (like the one on assessment that I really hoped to attend).. My colleagues and I agreed that at least half of the educators carrying devices were carrying iPads. *One such jammed session was hosted by the Zeeland Public Schools who are a year ahead of us in 1:1 implementation. The planning and integrity of their implementation impressed me greatly. But I also found myself reassured that our own Mercy 2.0 is addressing the key challenges that we will be facing. *Zeeland pointed out that no longer is a “business” model being held up to educators as they seek to integrate technology. With the iPad, schools like Zeeland (us!) are ahead of businesses. *The iPad instructional apps that I found most interesting took advantage of the camera or microphone. These clearly were game changers.